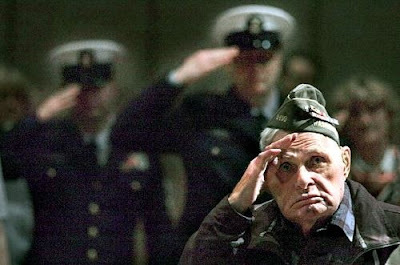 It is the the VETERAN, who salutes the Flag. We have many veterans who served our country and are still with us now to serve our city. We all have someone in our family or extended family that has served at one time or another and may have made the ultimate sacrifice. Give a moment this weekend to remember our fallen and let's all fly the American flag. 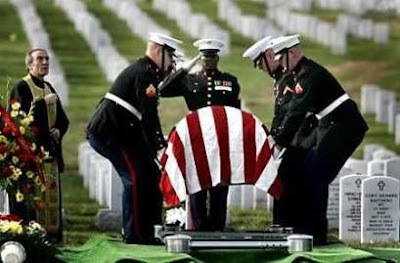 The Recruiting office will be closed on Monday, May 31, 2010 in observance of Memorial Day. The top pic with the gentleman saluting is my grandfather Joe. He would get a kick out of knowing he is on Google, he wouldn't know what it is though! Thank you for using this pic in a respectful and thoughtful manner! God bless!